What was the Vietnam War really about? 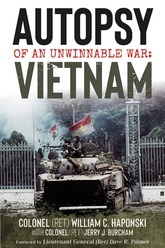 Offering an informed and nuanced narrative of the 30-year conflict in Vietnam, this book seeks to explain why America could not win the war. It is written by a combatant not only in six violent, large battles and many smaller firefights, but a leader with a full range of pacification duties, a commander who lost 43 wonderful young men and many more who were wounded, men who were bravely doing what their country asked of them. This story is the result of a quest for answers by a veteran who—after decades of wondering what it was about—turned to a years-long search of French, American, and Vietnamese sources. It is a story of success on the one hand, defeat on the other, and the ingredients of both, inspirational or sordid as they may be.